I spend a lot of time thinking about space in music. Two recent duo recordings with Portuguese bassist Hernâni Faustino are especially evocative of musical space: Domino Doubles is full of it, Falaise makes you aware of it. Music often implies structure that goes beyond the mere arrangement of its elements. It’s easy to forget that sound is utterly immersive; you can’t turn off your hearing, and you can’t ignore the subtle information sound coveys about your surroundings. This is coding that music can tap into as well, and it can set off our synapses in all kinds of suggestive ways. The ears can create a map or image in the mind just as easily as the eyes can. Superficially, Domino Doubles and Falaise are very similar. Close listening reveals different improvisational angles and recording approaches, however. 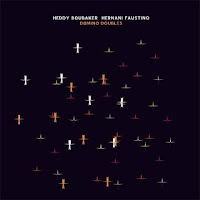 Domino Doubles matches Faustino with musical polymath Heddy Boubaker on alto and bass sax, a pairing that places a lot of emphasis on aesthetic, compositional space (in the sense that you’re making decisions about the arrangement of sounds during improvisation). 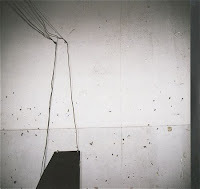 On Falaise (with Pedro Sousa on tenor), what’s evoked is actual physical space as conveyed through sound— aural architecture. Faustino is obviously the shared link here. He’s amassed a lot of improvising credibility through his membership in RED Trio. Though they heroically attempt to overcome most limitations, Faustino is usually pitted against two instruments that are fairly inflexible in terms of pitch: piano and drums. It’s refreshing to hear him in a more fluid context, especially with two players so skilled in extending the expressive range of the saxophone. 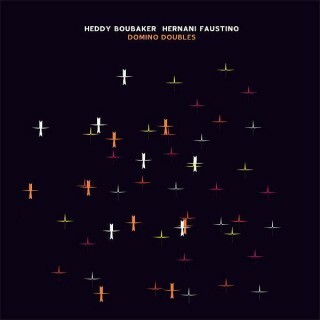 Boubaker’s technique may be a bit more subtle, esoteric even, but Sousa has an impressive command of the outer-reaches of the tenor for such a new face on the scene. Faustino is clearly inspired in both pairings, though he often defers to Boubaker on Domino Doubles. Both are headphone albums. Domino Doubles seems to materialize from somewhere inside your head. Boubaker has a fine-spun control over his signal, bleeding overtones that feel like some kind of trippy inner-skull resonance. There are small, breathy gestures, splintered harmonics, peals of arco sawing, bent notes. Much care is given to the placement of sounds, perhaps as much as the choice of sounds themselves. Tones linger, are allowed to settle and vanish. With so much riding on the details, both players are pristinely recorded. Falaise can seem just the opposite. Fine minutiae give way to the force of combined sound. The recording is clear, but it’s as though one microphone is placed close to Faustino, and Sousa’s long, rich tones seep in from somewhere across the room. The sense of the playing space is palpable, and the two capitalize on this natural resonance by converging on tones or crafting repetitive motifs that meld together into complex drones. In these duos, space is made real through the fullness of reverberating sound, or thrown wide by the silences in the music. One traces the acoustics of a performance space, the physical potential of sound as it’s shaped by matter, the warm aura as lambent tones redouble and re-cross. The other drops charges into the echoless darkness inside your skull, pits sound against sound, like searing drips of color that burn brightly against a canvas of negative space. Neither should be missed. Falaise is superb and stands out as one of the superior free improv duets of 2012.